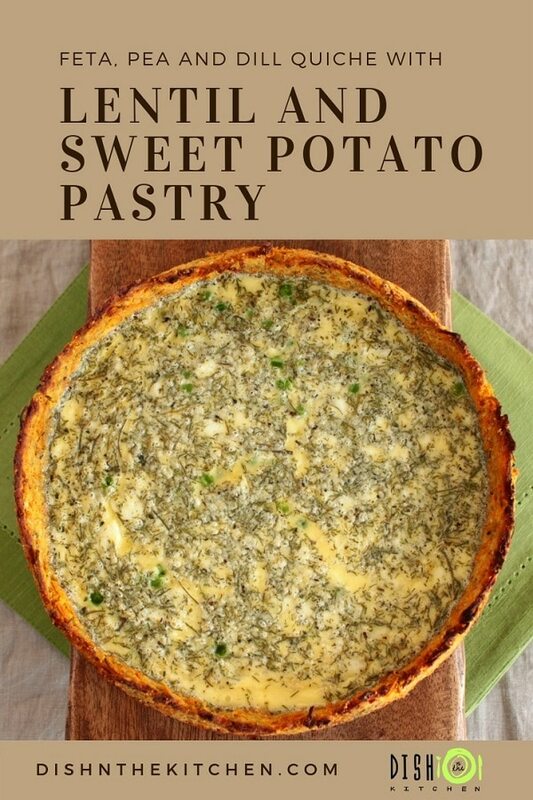 This delicious dill, pea, and feta vegetarian quiche wrapped in a gluten free lentil sweet potato pastry was submitted in the Canadian Lentils Recipe Challenge. It won best in ‘Freestyle’ category. I just love a good food challenge! When Canadian Lentils announced their 2014 Lentils Recipe Revelations Contest, I immediately started to brainstorm. It seemed like virtually every idea I came up with had been done in some way or form. Is there any more room for original thought anymore? 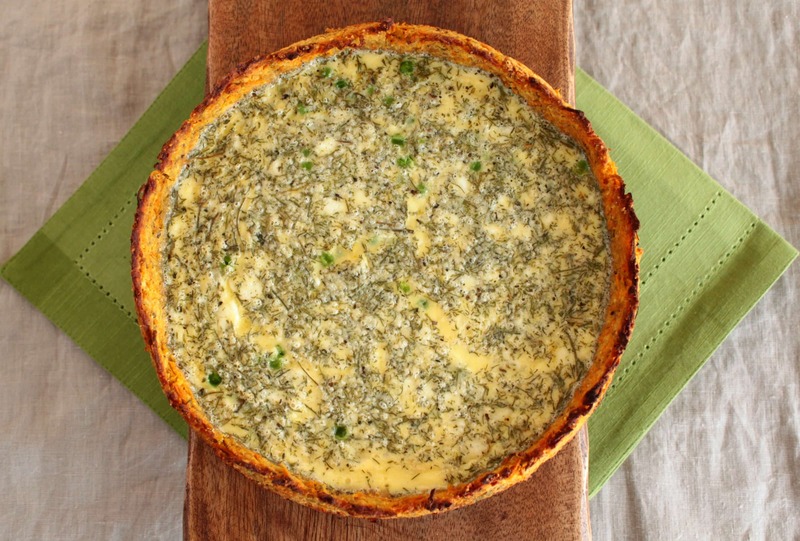 Suddenly it dawned on me…why not try making a quiche crust out of lentils? I know there are people out there (including my sister) that favour gluten free diets and many of them are super creative. A quick Google search revealed crustless quiches, lentil crust quiches, and sweet potato crusts but there were no combinations. Right then and there I decided to take both of these ingredients and combine them to make a lighter, crumbly sweet potato and lentil quiche ‘pastry’crust. This entire recipe was designed with my sister in mind. Her special dietary needs (low gluten/low refined sugar/low GI diet) have been a large part of her life for the last two years. She’s making a lot of progress and I’m so proud of her. 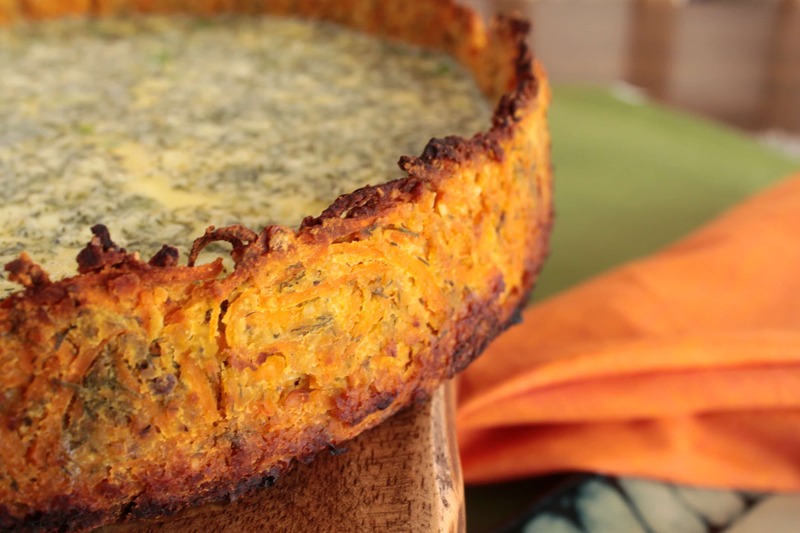 This Feta, Pea and Dill Quiche with Lentil Sweet Potato Pastry recipe is dedicated to her. Love you sis! To begin the Lentil Sweet Potato Pastry I washed 125 g of red lentils and boiled them in double that amount of water until they formed a thick paste. Then I shredded one half of a sweet potato with my food processor’s large shredder disk, and for the other half I used the small shredder disk. As the lentils cooled, I wrapped the shredded sweet potato in cheese cloth and twisted until juice came out. To make the sweet potatoes mixture dry enough I had to really squeeze hard. The mixture was a bit sticky, so I lined the sides and bottom of the pan with buttered parchment paper. I pressed part of the mixture into the bottom of the pan then around the sides. Because there was still a large amount of water in the sweet potato, I ended up baking the crust for around an hour. After the first 20 minutes I covered the edges with foil to prevent them from getting too dark. Since the Lentil Sweet Potato Pastry had a lot of flavour on it’s own, the best filling would consist of subtle ingredients that wouldn’t stand out too much. 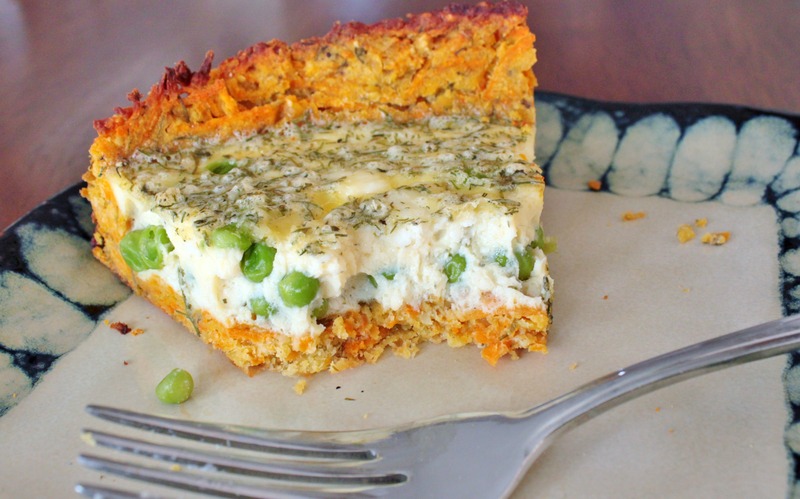 Peas and feta are a classic combination, delicious on their own while still allowing the lentil and sweet potato crust to shine. They Declared this Quiche a Winner! Unfortunately my sister doesn’t live nearby so she didn’t get to try the quiche. My family did (with much trepidation) and they were were really surprised at the lightness of the crust and the quiche flavours. Previously ‘meatless’ dinners have not been a crowd favourite around here but this one was a winner. Either they have grown up a bit and their tastes have changed or they just plain enjoyed this unique dish. Or both. 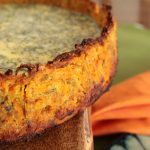 A delicious dill, pea, and feta quiche wrapped in a gluten free pastry made with red lentils, almonds, and grated sweet potato. In a small saucepan, boil the lentil in water until it becomes a thick paste. Chill. Place grated sweet potatoes in cheesecloth and squeeze to get water out. You may have to do this several times. Place all ingredients a bowl and mix well. Rub the butter on the inside of springform pan. Cut a baking paper circle to fit the bottom of the pan and one or two long rectangles for the sides. Stick rectangular paper to sides making sure one edge overlaps the bottom of the pan (you will have to do this with the pan sideways). Place bottom into the pan and snap closed. Place paper liner into the bottom of the pan and grease the paper with butter. Press mixture into pan starting at the bottom and then on the sides. Make sure to press down firmly. Place springform pan on baking sheet and place in preheated oven. Bake for 40-60 minutes until it is nice and dried out. You may need to put foil on the edges so they don’t burn. In a bowl whisk the eggs, yogurt, cream, salt, pepper, and dill together. Add the peas and feta then pour into baked crust. BAKE in center of 375°F oven until center is almost set but jiggles slightly when dish is gently shaken and knife inserted near center comes out clean, 30 to 40 minutes. NOTE: You may need to put foil on the edges so they don’t burn. That looks effing delicious. I’m gonna try that crust for sure!!! A win for gluten intolerant folks every where! I’ll be giving it a go don’t you worry! Seriously yum! I am food processor-less. Do you think that maybe cooking the sweet potatoes first would work? Well, you could just grate them with a cheese grater. You could either do this before or after you cook them. Probably easier before. I had wondered about grating them, then cooking them for a bit to get rid of the moisture but in the end it’s still extra cooking time. Let me know if you try it another way. Love the crust – very creative. I’ve seen “hash brown” potato crusts before, but the addition of lentils was inspired. you mean with grated potato, not the cubed frozen kind…right? Ha! It never even occurred to me but yeah that would work too. Hmmm that would be so good! Aren’t grated potatoes the only way to make “real” hash browns? I liked the way the lentils acted as a binder to hold the shape of the grated sweet potato. Also, good flavor combination. This is brilliant! And beautiful! Opening a Cafe/Coffee Bar this spring and going to put this on the testing menu! Looks amazing and I am sure tastes even better than it looks. Well then. I just don’t know what to say. How cool is that? On my second go of this quiche crust I was going to make the red lentils into a very thick daal and make it Indian inspired…I think it could be quite delicious! Our speaker for April is Anita Rossiter who is talking on the gut brain connection. Her healthy diet is not as omnivorous as the standard food pyramid or plate or whatever shape the gov is pushing now. No sugar, no gluten – So I”ll have to lift the bar on Astro $1 a head catering beyond ‘mystery dip’ and the staple packet mix glutenfree choc brownies 🙂 Granted they have no e numbrs on the mix and i make it with fresh nuts, freerange eggs and great butter, but i can’t help feeling a wee bit guilty when they are complimented. 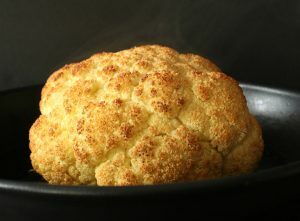 My canadian friend Bernice’s food blog to the rescue. Her sister follows a similar diet to Anita and she’s entering this unique quiche and these hors d’oevre sized morsels in a contest and i think they will please both Anita and our non-vegetarian members. Leave her a nice comment if you want to help it win! Shrimp Lentil and Turmeric Dumplings. 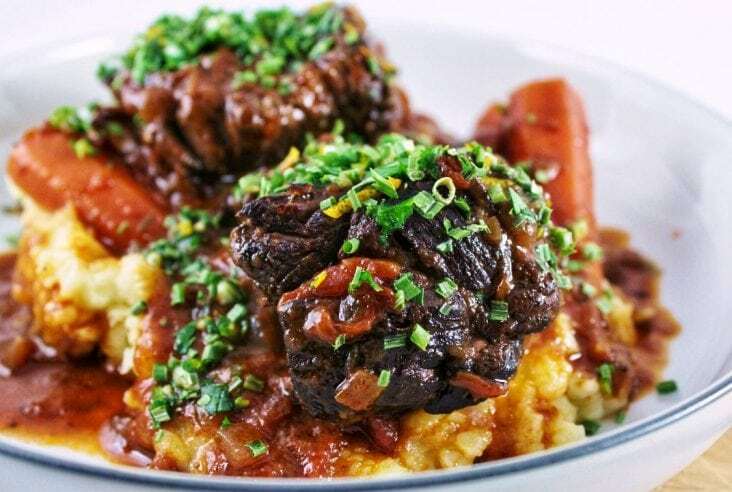 Confession – after watching the Julia Childs movie my teenage son and i decided to bake our way through a cookbook one recipe a day. Only we chose Womens Weekly Cakes and Desserts. After only a week we realised this would kill us, and I was running out of people to foist the leftovers onto. So I started baking cakes for Astro as a monthly treat. Brilliant! The crust is so unique and your filling looks like a perfect match with it. I’m going to try this for sure. 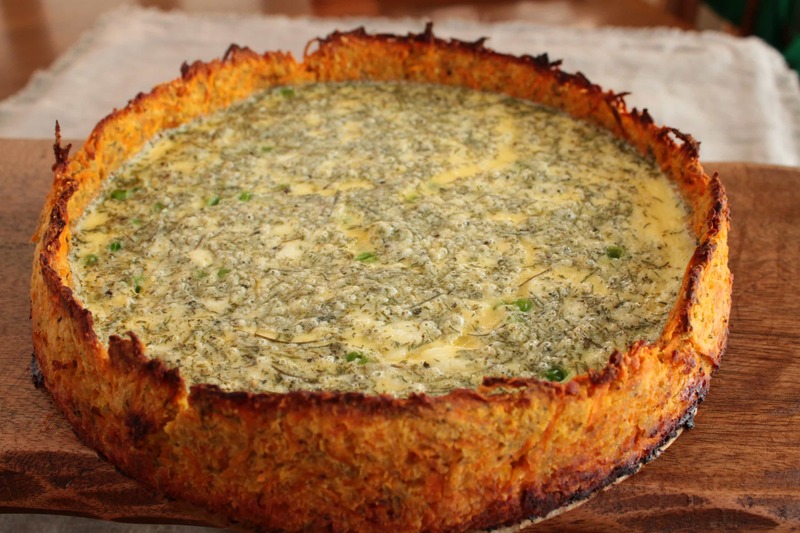 how long do you bake the filled quiched for? It took about an hour but it all depends on how moist your sweet potatoes are. If you check on it while you are baking you’ll see it goes from lookiing pretty wet to dry with some slight cracks. That’s when you want to take it out. This looks really, really wonderful – absolutely inspired combination of ingredients – I have bookmarked this page! Thanks so much! Wow, thank you so much for the kind comments! Please do let me know how it goes if you make it. The crust wasn’t really sweet. Give it a try…you never know! Great to meet you as well Laureen. One for my Halloween party. Sounds lovely. yes, I suppose it might fit in with a Halloween theme. Please let me know how it goes. I’ve been putting together a bunch of ‘legume’ dishes (and consequently gluten-free) for my brother. This sounds interesting! super! Let me know if you do decide to give it a try.